Smoking and Chronic Pain - Center for Pain Medicine, P.A. The hazards of smoking are well-­‐known: lung disease such as COPD, emphysema, chronic bronchitis, as well as lung cancer and asthma all occur at higher rates among smokers. 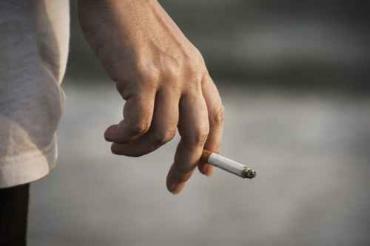 What you may not know is that smoking is a significant factor in chronic pain. It can increase your sensitivity to pain, accelerate painful medical conditions, and impede healing. Recent studies suggest the number of smokers who seek treatment for chronic pain – more than 50% -­‐ is disproportionate to the 22% of nonsmokers who seek pain treatment. The other side of those numbers also indict smoking: people who experience chronic neck and back pain over extended periods of time are much more likely to be smokers. Statistics reveal that smokers report greater pain intensity and greater loss of function than nonsmokers. Smoking can also exploit and exacerbate mechanical weaknesses that cause pain. Oxygen is the great liberator – it delivers healing powers through the blood to joints and muscles. Smoking constricts blood vessels, which decreases free blood flow and oxygen delivery, as well as increases heart rate and blood pressure. Smoking makes blood “sticky,” leaving fatty deposits on artery walls, which can lead to pain related to poor circulation as well as blood clots or heart disease. Bone health is greatly affected by the toxins from nicotine, which kill bone-­‐making cells. Smoking increases the risk of osteoporosis, a condition evidenced by a loss of bone mass. Malnourished vertebrae can contribute to poor posture, deteriorating discs, and muscle tissue damage, all of which result in back pain or even chronic back pain. Perhaps worse than contributing to pain, smoking inhibits healing. As a body heals from wounds or injuries, bleeding and clotting may occur first, then infection-­‐ fighting, followed by tissue reconstruction. Tobacco and the toxins ingested by smoking interfere with the duties of the cells and proteins in each of these stages of healing. In fact, many hospitals and clinics will not perform even minor surgical procedures until a patient has been smoke-­‐free for a period of time. The good news? The body rewards quitting! After as little as 48 hours, damaged nerve ending are on the mend and a sense of smell is en route. Within three months, circulation improves. With each passing day, systems recover with pain and pain risk factors on the decline.